Grab your kids for a fun Father's day photo shoot. 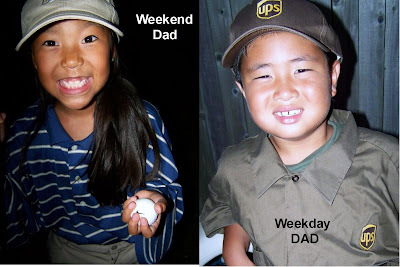 They put on dads clothes and we had fun taking pics of weekday dad in his UPS uniform and weekend dad in his golf clothes complete with golf ball and putter. Then the kids made him a card and we had the pics printed. You could do this with a business suit, construction clothes, whatever your dad wears on a daily basis to work. If your dad isn't a golfer you could do swim trunks and a surfboard, shorts and t-shirt, running gear, etc. You've got the idea. Put those thinking caps on and get to work! Girl you're so creative! I need just a tenth of your creativity PLEASE!!! You might need to help me w/Eli's CARS b-day coming up!